This is embarrassing, given the company’s insistence on usage-based billing for its own clients and for other clients of other Internet service providers that rent its network. 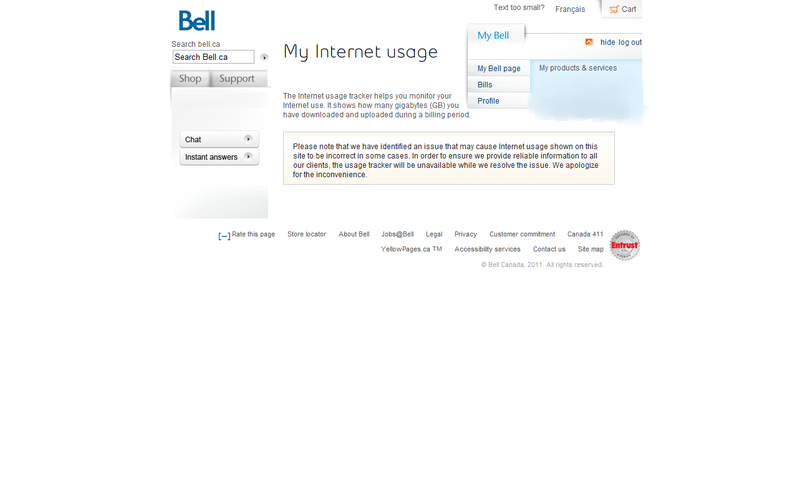 Bell posted a message at its website yesterday, where clients log on to track their Internet usage. “Please note that we have identified an issue that may cause Internet usage shown on the site to be overstated in some cases,” it said. I’ve heard from three Bell customers who said their Internet usage shown by the website’s tracker exceeded their actual usage. Allan Taylor said he never went over 2.5 gigabytes a month, since he didn’t download movies, but was charged for exceeding his 25 GB limit. Jerry Shulak said Bell’s Internet tracker showed him using 2.7 GB of data on Feb. 2, a day when he used 150 MB (megabytes) at most. On Feb. 5, he drove the United States for a day and unplugged his phone line from the computer modem. “Almost 500 MB of phantom data usage,” he says about Bell’s tracker. Michael Stortini’s Internet usage never went over 0.72 GB a month, he said. Yet he was charged over $20 in fees last December for usage of 10.38 GB, despite no change in his Internet habits. Bell showed his Internet use at 25.76 GB over the Christmas holiday period. Yet he was away from home for 12 days. Only a small minority of customers was affected by the tracking errors, said Jason Laszlo, a Bell spokesman. “It’s never good to impact even one, but let’s keep scale in mind – it’s less than 0.1 per cent of our Internet subscriber base affected and we’re making good to all of them. But yes, the timing is awful,” he added. 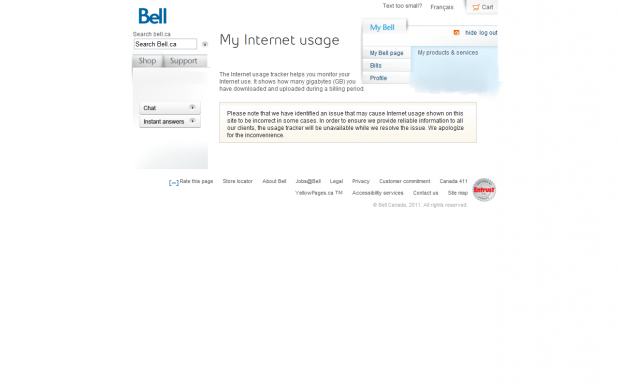 via Bell admits errors tracking clients’ Internet usage – Moneyville.ca. This entry was posted in Tech News and tagged bandwidth caps, Bell Canada, billing errors, UBB, Usage Based Billing, usage tracker on February 9, 2011 by Brad.